This release begins a trilogy of double bills, with each double CD presenting a pair of two-part stories, one story per disc. This length of narrative is more associated with the revived television series, though the classic show did do the occasional two-parter in its time. Indeed, Peter Davison, the Doctor featured in this production, has three of them to his name. Taking another leaf out of the book of new Who, the titles of these ‘two-in-ones’ reflect the complementary pairings of Series 9 – Heaven Sent / Hell Bent, and all that. As a result of the shorter duration, the pace of the plot is ramped up, especially during the opening tale, Stephen Cole’s Alien Heart. Before you can say “time spillage”, the Doctor and Nyssa (Sarah Sutton) have encountered destroyed planets; temporal instability; a horde of sticky, green, spider-like creatures; and investigators from Earth’s Empire – one of a number of unobtrusive continuity references in this tale, which also include the Guild of Adjudicators, a Beta Dart, and traces of lucanol. I did find it a little hard to grasp what was going on in Alien Heart at times. This is partly due to the very visual nature of some of Stephen Cole’s ideas, partly because some of the action later on in the story is reported in dialogue rather than taking place in the present, and partly because the villains’ scheme is extremely convoluted. I’m not convinced that arresting a planet’s rotation by temporally freezing its core would cause the atmosphere to be sheared away, even in the wacky and wonderful world of Doctor Who – wouldn’t the atmosphere be frozen in time as well? No, my heart wasn’t in this one so much. The Daleks actually make their entrance earlier than I had expected – during the second episode of the previous story rather than in this one. Somewhat in the style of Frontier in Space and Planet of the Daleks, Alien Heart ends on a cliffhanger, which leads into the events of Dalek Soul. Consequently, this release feels less like a pair of two-parters than a four-parter of two halves, such as The Ark. 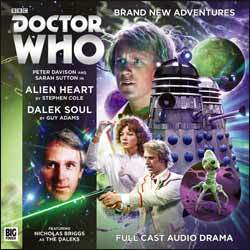 Having said that, Dalek Soul is not a direct continuation of Alien Heart. The cliffhanger is not recapped or resolved until quite some way into the story, so at first you might wonder whether you’ve missed something. Again, a lot of incident is reported in dialogue, ‘off screen’ as it were, though on this occasion I didn’t find it so confusing, because it tends to happen at the beginning of Guy Adams’s story rather than towards the end. As a result, you have most of the two episodes to get your head around the situation – that Nyssa is now working (unhappily) for the Daleks, that the Doctor has joined a rebel group, and that a very long time has elapsed for both of them. I’m proud to say that I twigged what Nyssa was seeing at the end of the first episode, even though it isn’t disclosed until the climax of the tale. This pays off on a menace that was threatened but not actually unleashed during Resurrection of the Daleks, and it allows Sutton and Davison to play their characters in different ways than normal. Davison in particular clearly relishes being a baddie, an opportunity that he doesn’t get very often. You might say that he puts his heart and soul into it!